Occasionally Tony will pick up a tune that just seems to feel so natural to play, so easy on the fingers, it rolls off the musical tongue so to speak. This is one of those tunes. It’s eerie but it’s as if Ryan composed this for guitar. It’s the perfect range for the guitar, played between a Low A and the A two octaves above, there’s plenty of space between the notes, no high B to “fret” over, and a busy chord progression to play with. Tony O’Rourke is a well-known Melbourne musician. Listen in while he attempts to teach Gerry Gaffney traditional Irish music on the guitar. There are over 90 individual lessons, all freely available here or via iTunes. Accompanying the lessons are downloadable books with commentary, sheet music, tab, and chords. An ideal companion for learning Irish tunes. 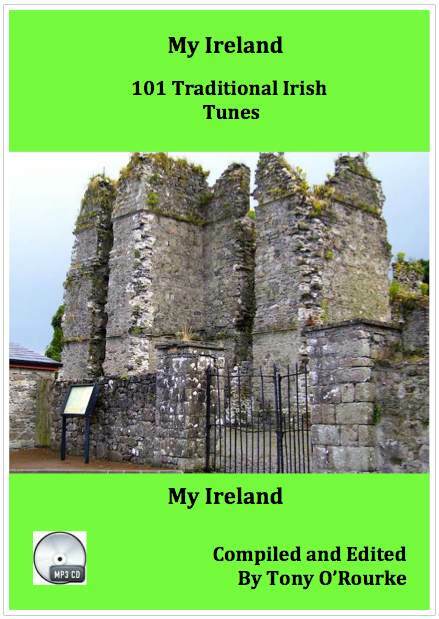 With 101 tunes in all - Jigs, Reels, Hornpipes, Polkas and O'Carolan tunes - the book contains sheet music and chords for all the tunes, with MP3s of Tony O'Rourke playing the tune on a banjo at a moderate pace, with guitar accompaniment. You can download a free sample of the book (PDF, 840k), which contains the full table of contents and a few pages of the sheet music and tablature, and listen to each of three tunes: Coalminer’s Reel(A), Cat That Ate The Candle (a Jig), and O’Carolan’s Concerto. The bargain price of $10 (US) will get you unlimited access to the book and all 101 tunes. You can download the book (which is 10MB) and access individual tunes whenever you like (or download all the MP3s if you prefer and use them locally).